Random errors are inevitable... We can find in the Bowditch chapter 16 (Nathaniel Bowditch, The American Practical Navigator, an Epitome of Navigation, pub. n°9 NIMA, USA, 1995) 19 possible errors when observing the celestial body height and 30 possible errors until the LOP can be drawn on the chart. In case of random errors, without further statistical analysis, the True Position can be on the left or on the right of each LOP, with an equal probability. Each LOP divides the world in 2 areas and the True Position has exactly 50% of chance to be in one of them. There is no - - - zone. The True Position just cannot be in the - area of each LOP and the cocked hat still be shaped as drawn! So we know that the True Position is in the + area of at least 1 position line. 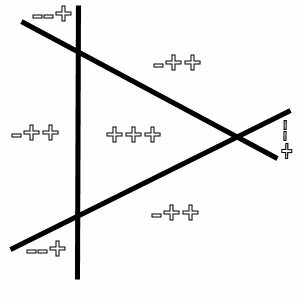 The True Position can be found by flipping a coin twice (head side is +, reverse side is - and each occurrence has a 50% probability). The True Position is the cocked hat centre if there are no random errors and the observations azimuths are spread over more than 180°. 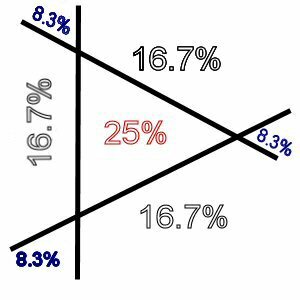 If there are random errors, then the most probable position (MPP) is inside the cocked hat but with a probability of only 25%. © 1999-2018 Johan Machtelinckx, all rights reserved.